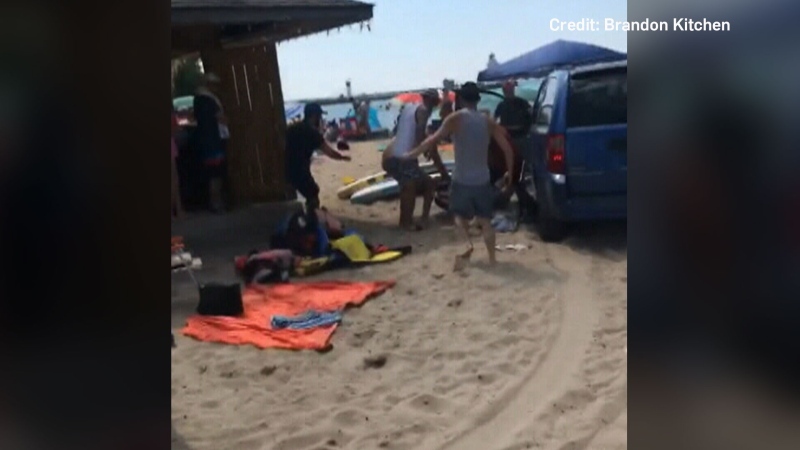 Video shows minivan driving on beach in Port Dover, Ont. A blue minivan can be seen in a cellphone video backing down the beach mere metres from people. The vehicle enters a parking lot, then mounts a sidewalk and drives back onto the beach, forcing people to dive out of its way. Bystanders can then be seen in the video pulling the minivan’s driver out of the vehicle. Brandon Kitchen posted the footage on Facebook, where he called it the “scariest thing” and apologized for his profanity while filming it. “Many open and empty booze bottles and him screaming as he's (restrained) by civilians ‘you will all pay for this,’” Kitchen wrote.